Vietnamese Egg Coffee In Saigon - Simple Recipe Included! Vietnamese Egg Coffee in Saigon – Simple Recipe Included! ​Most people like their eggs sunny side up placed neatly beside strips of well-done bacon. That used to sum me up before I moved to Vietnam. Now I like my eggs in my coffee. I didn’t even know that egg coffee was a thing until I came to Vietnam. Initially, I assumed it was all an elaborate trick done by my friend who loves to take advantage of my gullibility from time to time, so I turned to Google, thinking I’d be able to laugh in his face for his failed attempt at making a fool out of me. It backfired. To be honest, I don’t even know why I thought the concept of egg coffee was so absurd, considering all the weird food I’ve seen and tried in Asia. So yes, egg coffee IS a thing and here’s an all-you-need-to-know article about egg coffee and all that it entails. Where & Why is Egg Coffee a ‘Thing’? 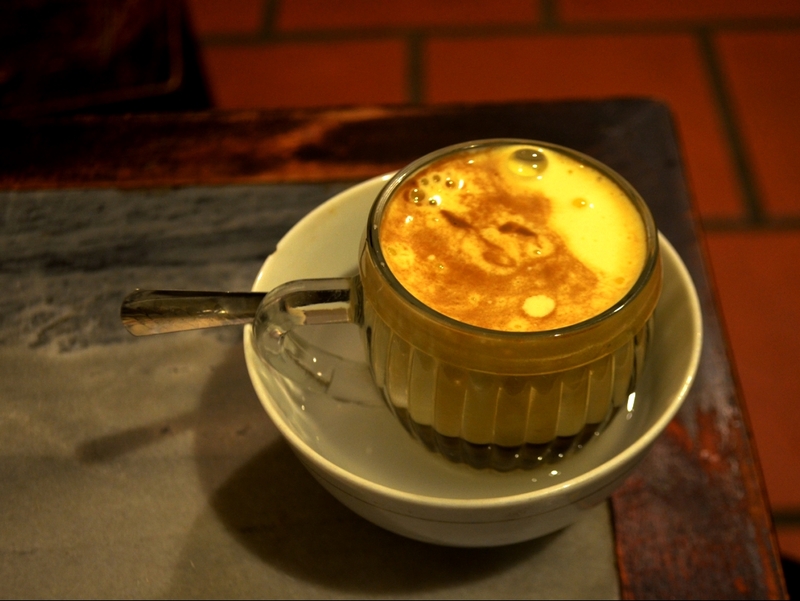 Egg coffee is popular not just in Vietnam but also in other countries such as Sri Lanka and Cuba. It is quite popular in Scandinavian countries too. In Norway and Sweden in particular, people add eggs to their coffee to change the taste and the look of the coffee. What happens is that the proteins in the egg bind with the bitter-tasting polyphenols in the coffee to form insoluble complexes that will precipitate, which will then be filtered out. Once that is done, the resulting coffee will look clearer and taste milder and smoother. Should’ve paid attention to your Organic Chemistry classes in high-school. For more information on the mechanism, you can click-through to here. Cracking an egg in your coffee comes with some benefits to your health. 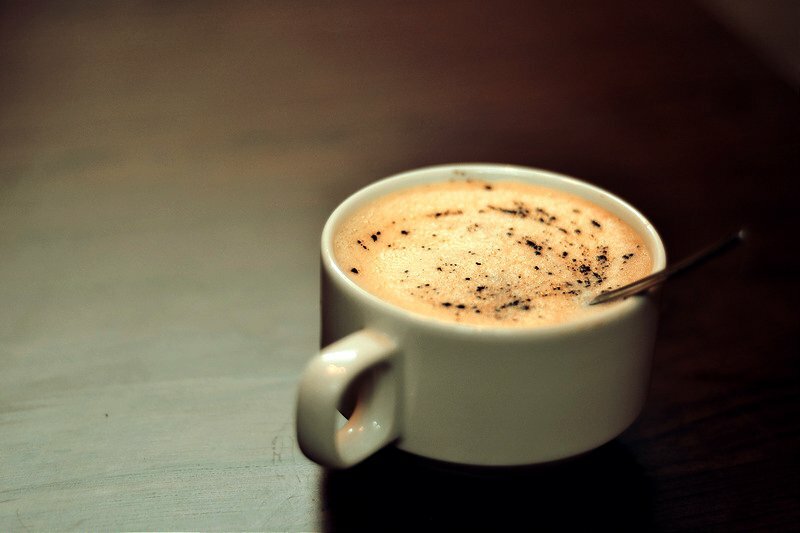 Of course, coffee alone is famous for boosting your metabolism, boosting your energy levels, and protecting you against certain diseases. But what happens when you add just one more ingredient? Eggs are an incredible source of micronutrients – they contain everything necessary to build a baby bird from scratch. I’m not calling you a baby bird, but that’s something right? The yolks that are used in the coffee (you’ll see below that the whites are discarded) are rich in Vitamins A, D, E, and K, among necessary dietary minerals and antioxidants. Eggs also have beneficial effects on one’s cardiovascular health, metabolic health, and one’s memory and cognitive functions. These are to name a few. You can read more here. In contrast to Scandinavian egg coffee, Vietnamese egg coffee is neither mild nor smooth. Here’s a fun fact: Vietnam is actually the 2nd largest exporter of coffee in the world. Coffee is not just a drink here – it’s a way of life. Numerous coffee shops and stalls decorate almost every street corner. 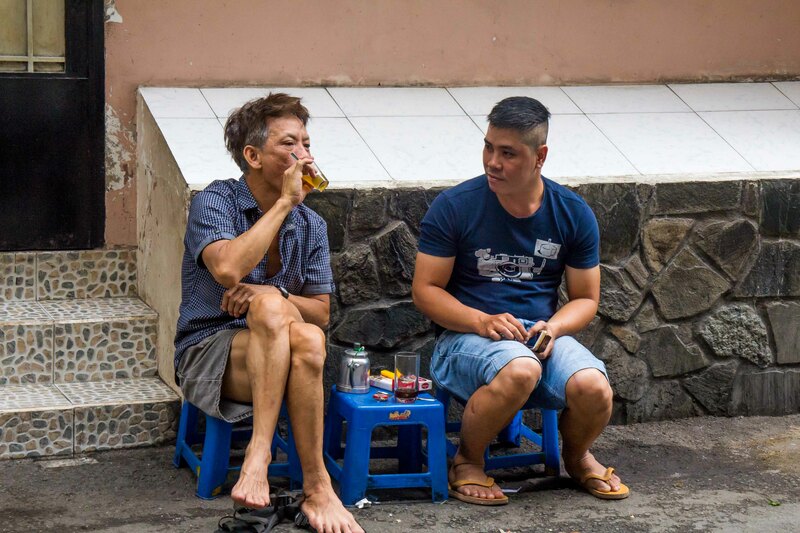 No matter the time of the day, you will find at least one contended soul sitting on a little child-sized seat on the pavement, sipping a tall glass of ca phe sua da which directly translates to iced coffee with milk. Coffee is not just a drink here – it’s a way of life. The coffee bean was initially introduced to Vietnam by the French, but planting the colonial seedlings was all they did. 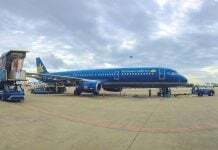 Since then the Vietnamese have completely made it their own. Most of the coffee plantations of the country are in the hills of Daklak, Gia Lai and Da Lat, all located in Southern Vietnam’s Central Highlands. Not only does the cool microclimate of these mountainous cities create the perfect conditions for the coffee plant to thrive but it also gives the bean a unique taste. What never ceases to amaze me about Vietnamese coffee culture is that unlike in the west, where coffee is had in the morning to wake up a slow brain, or later in the day with the purpose of wanting to continue being awake, coffee to the locals is not solely a morning thing. In fact, it appears that coffee shops here are actually mostly active in the evenings. To the Vietnamese, having a coffee is also a “sit down” experience they share with family, friends or coworkers. The concept of taking it “to go” is not very common. Ca phe sua da mentioned earlier is what you are most likely to come across everywhere. The brew is made using a traditional filter system called a “phin“. This phin filter is filled up half way with medium ground Vietnamese coffee, and then boiling water is simply added to the top. The two mix and slowly trickle down, drop by drop through the filter, and into a glass that is lined with condensed milk. To this, ice is added. The resulting coffee is not only light but sweet and rather thick too. An interesting note: This habit of using condensed milk came about during the French War as there was a shortage of fresh milk during this time. 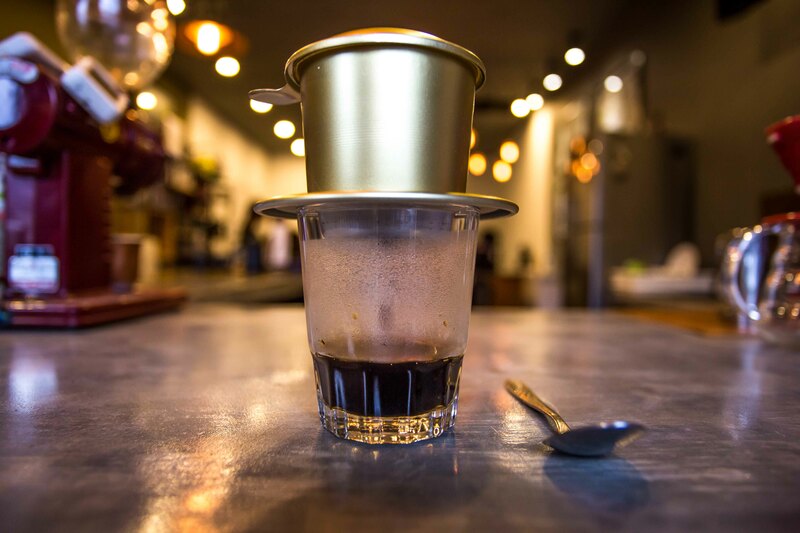 For more information on how to brew a cup of ca phe sua da, refer to this article: How to Brew The Perfect Cup of Vietnamese Coffee. The habit of using condensed milk came about during the French War as there was a shortage of fresh milk during this time. Vietnamese egg coffee, “ca phe trung“, is only slightly different when it comes to the ingredients and preparation. The only addition to this cuppa is a whisked-up egg yolk. 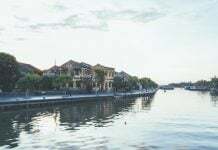 My first try was at a café in Hanoi, of which I do not remember the name and even though initially there was a bit of an ick factor, I soon got over it. I had to drink a second cup. The only way I can really describe it is that it tasted like a foamy tiramisu crème brulee. 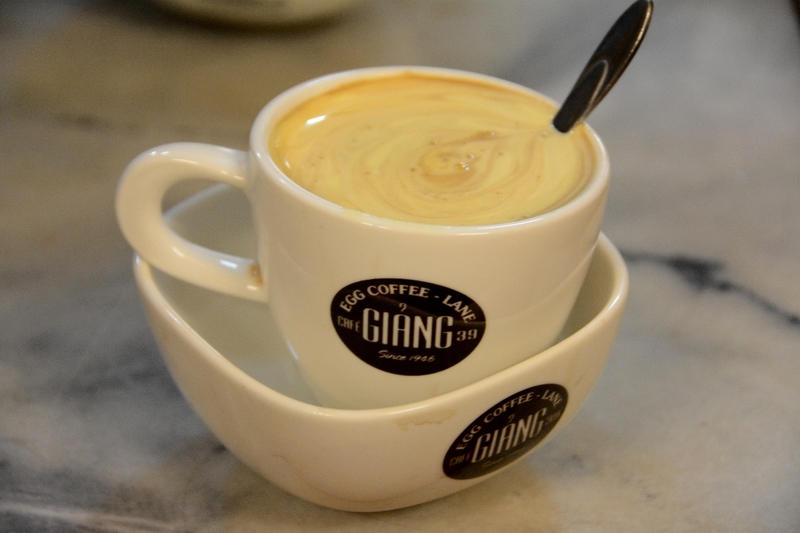 It was then casually recommended to me that I try the egg coffee served at Café Giang in 39 Nguyen Huu Huan. 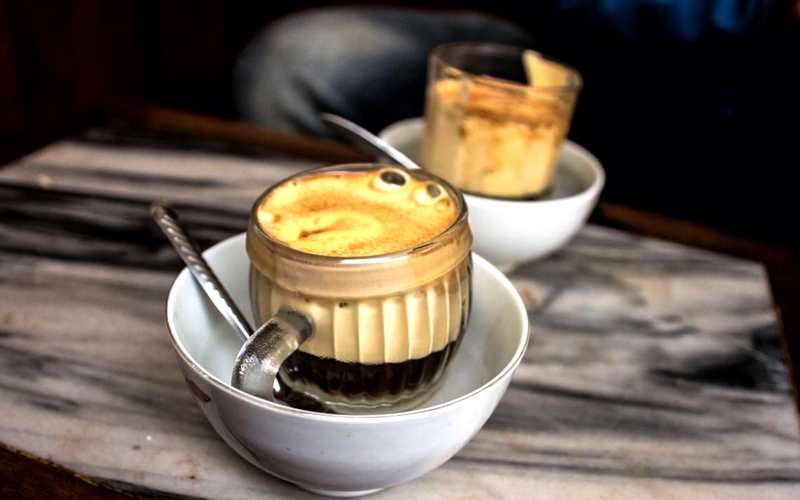 It was a masterpiece – absolutely delicious, and only later did I find out that it was here in 1946 that the first egg coffee of Vietnam originated, created by the founder of the café, Nguyen Giang. He didn’t mean to make it a thing, but apparently one day instead of using milk which was scarce at the time, Mr. Giang had whisked in an egg yolk as a substitute and the rest is history. The only way I can really describe it is that it tasted like a foamy tiramisu crème brulee. Step 3: Put the yolk, 3 tablespoons of sweetened condensed milk and a spoon of the brewed coffee in a bowl. Whisk vigorously until you end up with a fluffy mixture. You may use a blender if you wish. Step 4: Pour your brewed coffee into a nice glass and then line it up with the frothy egg on the top. Step 5: When you are ready to drink, use a spoon to mix the rich, creamy, custard-like top layer of froth into the dark, bold and rich coffee that lies beneath. Then repeat the whole process again for your second cup. There’s another way to make egg coffee. You just mix the egg directly into the brew with a little bit of milk and then whisk it. This is how you will find your drink in Da Lat and it is definitely worth a try. Your coffee will arrive at your table with a burner to keep it hot as you drink. If the mixture cools down, it will begin to smell unpleasant. That’s kinda gross, huh? Note: Of course you can experiment with the recipe. Perhaps a little bit of cinnamon, vanilla, turmeric, rum (yes, I went there) or even cheese. In Ho Chi Minh, cafes started serving Ca Phe Trung only since a couple of years ago – from about 2014. The most famous joint to get your hands on one of these is The Luu Gia Café at 08 Hoa Cuc, in the Phu Nhuan district of Ho Chi Minh. Over here you will find your egg coffee served Hanoi-style. So how ‘bout it? Why don’t you give it a go and let me know what you think in the comments? 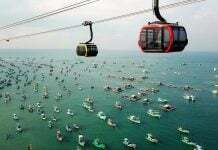 Enjoyed this article and would like to read more about what to see, do, and eat in Vietnam? Follow us at the Christina’s Blog.